2016 was quite possibly the most eventful season in the history of the Albany Dutchmen. The franchise hosted two PGCBL playoff games, the PGCBL All-Star Game, and saw the team win a record 30 total games. Despite falling one game short of the first league championship series appearance in team history, it was undoubtably a successful season in the Capital City. With 2016 in the rear view mirror, the Dutchmen are taking the chance to look back at the year that was, spotlighting some of the best moments and performances of the standout campaign. In the two previous seasons, the Dutchmen had seen their playoff runs cut short at the hands of the Mohawk Valley DiamondDawgs. In dramatic fashion, Albany exercised thier playoff demons with a 2-1 victory over Mohawk Valley in eleven innings at Bellizzi Field. Each team managed a sole run in the game's first ten innings. The Dutchmen struck first in the bottom of the third with an RBI groundout from Jack Gethings (Fairfield), an unearned run that plated Jon Skidmore (Dallas Baptist), who had reached on an error. Mohawk Valley answered with one in the top of the sixth, as an RBI single from Kevin Radziewicz (Fairfield) scored Drew Arciuolo (Fairfield). The score remained 1-1 into the eleventh, with the nearest threat coming from Mohawk Valley in the top of the ninth, when Nate Harris (Louisiana Tech) escaped a first and third jam by inducing a groundout back to the mound. Albany's eleventh inning heroics started with a two-strike single from Gethings, who moved to second when Justin Childers (Ohio Dominican) was hit by the very next pitch. A daring double steal called by manager Nick Davey moved runners to second and third, and Kyle Skeels (Coastal Carolina) clubbed a sacrifice fly to left which allowed Gethings to slide under the tag for the walk-off win. The triumph sent the Dutchmen to the East Division Finals for the second time in franchise history. On perhaps the biggest night in Albany Dutchmen history, the eyes of the PGCBL turned to Bellizzi Field for the sixth edition of the Perfect Game Collegiate Baseball League All-Star Game. 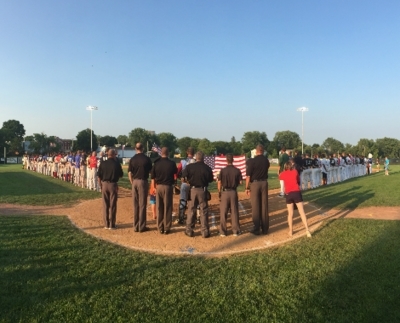 Before nearly 1,500 fans, a total that set a new park record, the brightest stars in the PGCBL came together. The festivites began with the annual Home Run Derby, which was won by Glens Falls' Chris Kwitzer (Buffalo). Kwitzer topped Saugerties' Vince Lakes and Elmira's Lucas Denney in the championship round. Malcolm Nachmanoff (Stony Brook) represented the Dutchmen. Five Dutchmen took part in the Midsummer Classic, including starting pitcher Evan Giles (Indiana State), who worked a scoreless, hitless frame. Jeff Rivera (Cumberlands) and Troy Montemayor (Baylor) also saw time on the mound in the East's 9-1 victory. JJ Shimko (USC-Upstate) started in left field, recording a hit and scoring a run. Justin Childers (Ohio Dominican) reached base as well, drawing a walk. Robbie Knightes (St. John's) of the Glens Falls Dragons earned MVP honors, driving in two runs on a fourth inning home run. It was another triumph for the East Division, who has won all five All Star Games that have matched the PGCBL's divisions against one another. For the second season in a row, Gavin Wallace (Fairfield) was given the ball by Nick Davey in an East Division Playoff game against the DiamondDawgs from Mohawk Valley. After drawing the loss in 2015, Wallace was brilliant in his second chance, allowing just one run over eight innings. The righthander cruised through eight on just 94 pitches, walking just one Mohawk Valley hitter. Wallace scattered six hits over his eight innings on the mound, and retired each of the first ten hitters he faced. In a game that was decided by a single run (see above), Wallace stranded runners in scoring position on three occasions, allowing the game to remain tied into the eleventh inning, when the Dutchmen pulled off their walk-off heroics. It was Wallace's third outing of the season of seven innings or longer, which all came in Albany victories. The Fairfield product did not allow more than two earned runs in any of his seven appearances, and only walked 11 hitters in his 41 innings. An assist on Wallace's performance went to Nate Harris, who earned the win over three shutout innings out of the bullpen. Harris went three innings or longer in four of his 2016 outings, allowing just one run in the 14.2 total innings. He was also the winning pitcher in the walk-off win over Amsterdam two nights later in the East Division Finals. After the second week of the PGCBL season, JJ Shimko (USC-Upstate) became just the fourth player in Dutchmen history to be named league player of the week. The three other players include Dutchmen greats Will Remillard (now with the Cubs organization), Matt Dacey (Tampa Bay Rays organization) and Sean Aspinall (Azusa Pacific). In the four games that comprised his award-winning week, Shimko went 7-for-13 with four runs batted in and five runs scored as the Dutchmen went 3-1. He had three consecutive multi-hit games in two runs at Saugerties and a victory at home over Saugerties. His top performance was a 3-for-4 effort in a June 10 win over the Stallions, where he drove in two and scored another in the 6-3 triumph. A First Team All-PGCBL selection, Shimko set franchise records in at-bats (168), hits (57), and stolen bases (28), and was named the team's Co-Player of the Year. He also finished in the top five in Dutchmen history in batting average, total bases, doubles, on-base percentage, and runs. All these performances and more made for an exciting and eventful 2016 for the Albany Dutchmen, and 2017 promises to be more of the same. Keep checking DutchmenBaseball.com for updates on the coming seasons, including announcements on the players who have been signed to play for the Dutchmen in the team's eighth season on the field.